What time is it in New York, Tokyo, New Delhi or any other city? 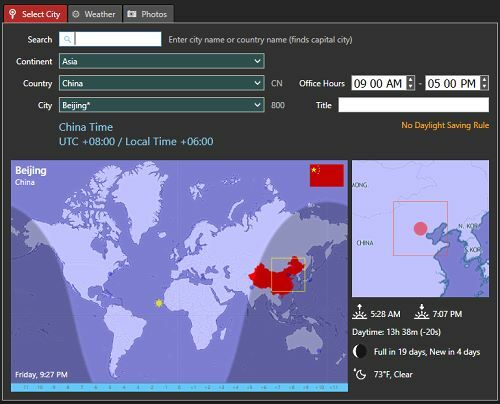 Sharp World Clock contains an integrated database with more than 23,000 cities. All cities with a population of more than 15,000 anywhere in the world are included. If there is no such city in a country, the capital city is added anyway. Also included is a collection of military time zones and UTC (GMT). The easiest way to find the city is to enter the first characters of the city name into the search field. If you are just looking for the capital city of a country, you can also enter the name of the country and the capital city will come up first. Instead of using the search function, you can also select a city by selecting continent, country and city in the drop-down-lists. Earth Shadow (the light parts indicate where the earth is directed to the sun - day time, while the darker part is in night time). The blue dots indicate the city locations of all clocks in your world clock collection (clocks in your main window and undocked clocks, if any). Move the mouse over a blue dot, to see information for that city. You cannot change the selected city for the world clock in the map though. In the zoom view on the right side of the world map you can drag the selected view to see a different clip of the map. You can change the displayed city name to any word you like. It can be the localized name of the city or the name of a person living there.